Here is a image from last summer when a thunderstorm had blown thru Madison Indiana and left that great light you don’t see very often what I like to call storm light. Storms that time of the year usually form and blow thru late afternoon and evening which is usually sweet light anyway but throw a storm into it and watch that light then !!! 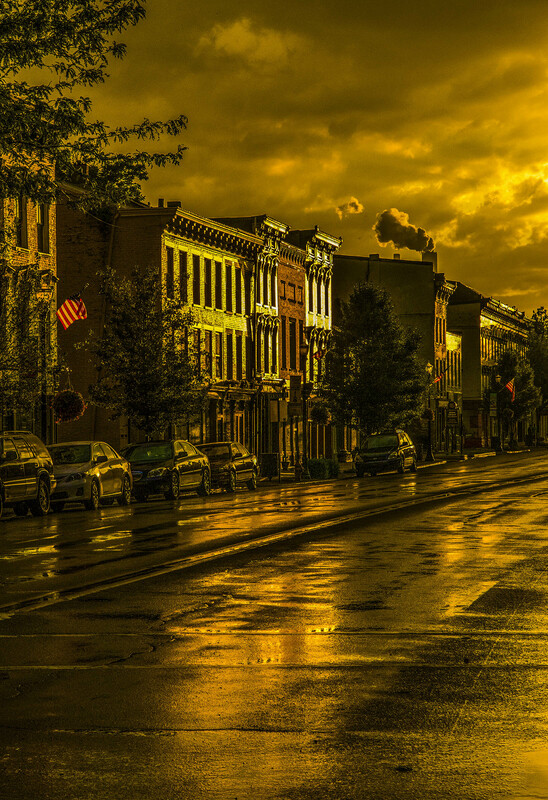 I sat out the storm at home but walked down to main street and waited for the light to shine thru. And low and behold it came out just like I was hoping, main street was washed in a warm soft light that added a golden touch to everything it touched. The same image in regular light would have not been very interesting but this light changed everything and added a beautiful dimension to the picture. 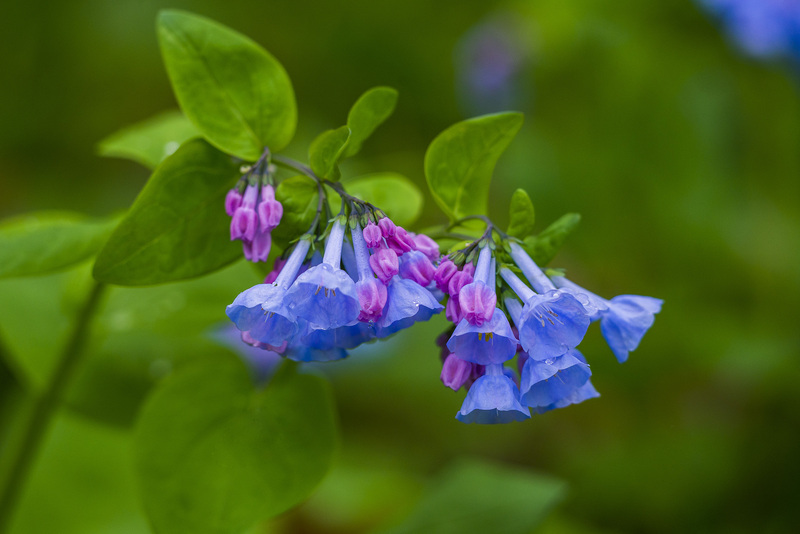 I hope you enjoy the image and thanks for taking the time to stop by and take a look. 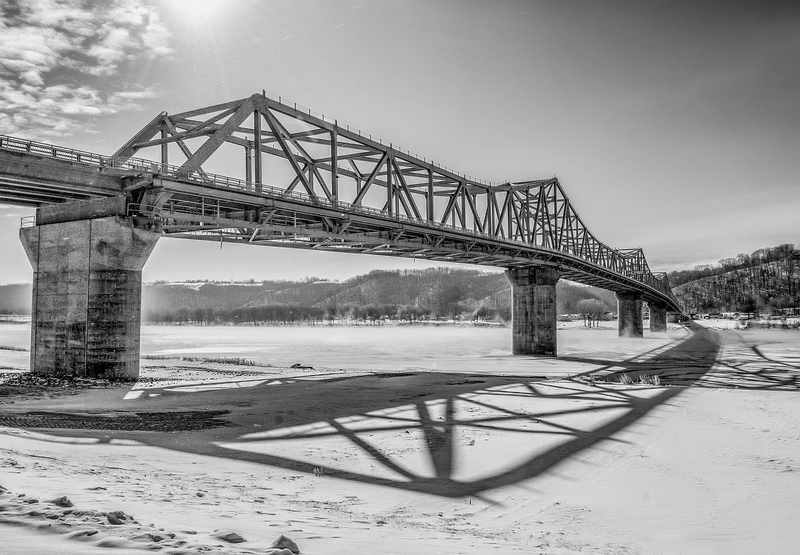 Here is another image of the new bridge over the Ohio River at Madison Indiana. This time I created this shot during a snowstorm at 3 am, best time to get out with no people in the way. All kinds of elements were going in this shot, light,snow and reflections in the river and I think I brought them together for a pretty good image. 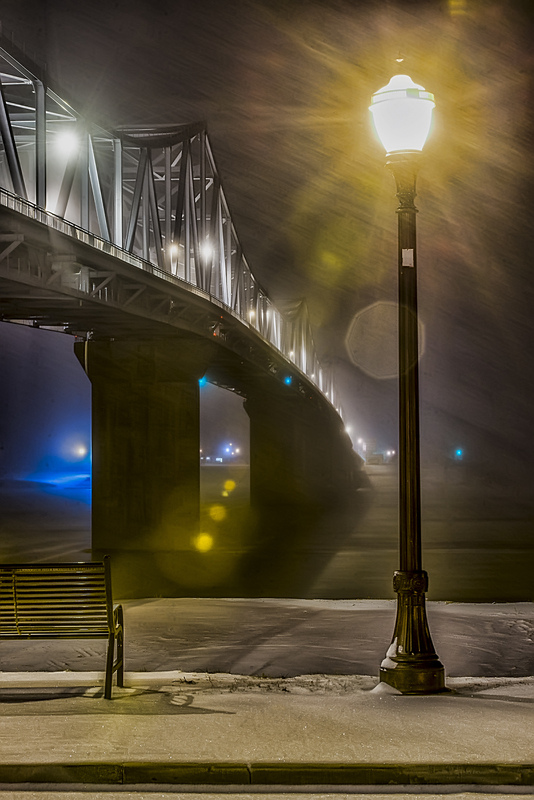 The bridge is just one of the many great subjects you can photograph here. Historic Architecture to beautiful natural settings, they all surround the Madison Indiana area making it one of the best spots in Indiana for photography. Hope you enjoy the image and thanks for stopping by and taking a look. Thought I would share more from that wonderful morning where the light just wouldn’t quit and I was able to create numerous images of that awesome experience. Being outdoors in search of photographic opportunities is always a good thing but when you combine it with fantastic light and it becomes really special. 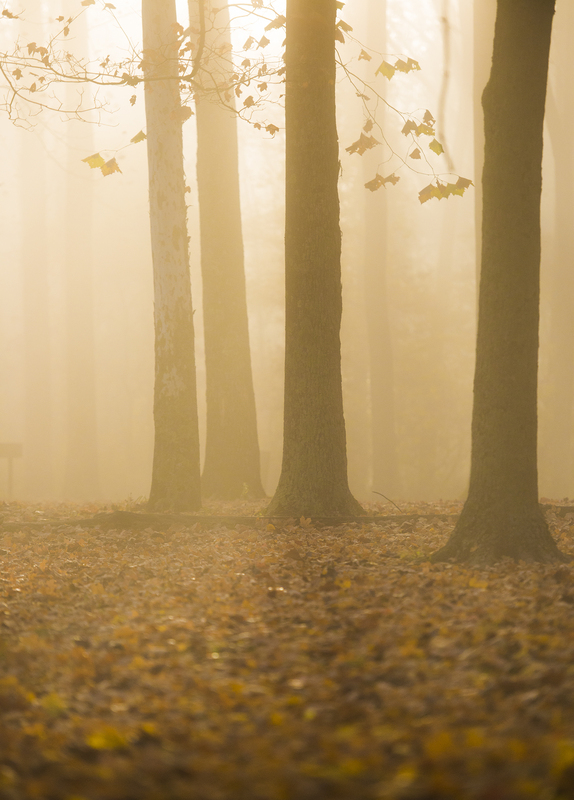 This one was taken when the fog had still not quite began to burn off and what little light was getting thru added a surreal touch to the trees that I was using as my subject. I actually came away with what I was looking for in that moment and thru the years I have found that is a hard thing to do. I hope you enjoy the image and hopefully you can find a morning like this one and be able to experience that special light that doesn’t come around very often. Thanks for stopping by and taking a look at my work. Since I am trying catch up on my posting here is a quick one from last fall, this was at the trail head for Hoffman Falls at Clifty Falls State Park in Madison Indiana. 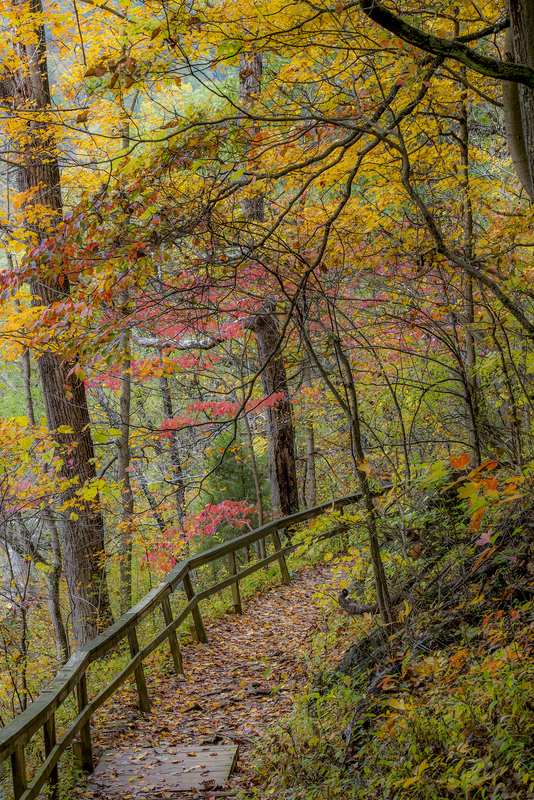 Fall is one of the best times to hike at Clifty Falls with its deep gorges, waterfalls and wonderful display of colorful leaves you can’t go wrong with a hike thru this wonderful state park located in Southern Indiana.